Described as 'unforgettable' by The Australian and 'barnstorming' by The New York Times, the Viney-Grinberg Piano Duo enjoy a stellar international profile. 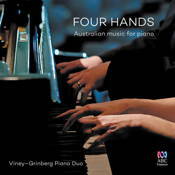 In their new album on ABC Classics, they survey recent music by Australian composers for piano four-hands, much of it receiving its world-premiere recording. Ross Edwards' A Flight of Sunbirds showcases a seemingly effortless affection; Carl Vine and Stuart Greenbaum's Sonatas explores the potential for four-handed counterpoint. Peter Sculthorpe's 'delicate and wistful quartet of beautiful tableaux' follow the tradition of arranging existing works for piano four-hands. And Elena Kats-Chernin's Victor's Heart uses the warm resonance of the form to create a touching musical tribute. For more information on this CD visit the ABC Classics website.